Science and technology have no borders! Invest in your future by developing cross-cultural skills that will enable you to communicate with scientists anywhere in the world. See your culture and yourself from a different perspective. Learn to appreciate other languages and global perspectives, while better understanding your own values. 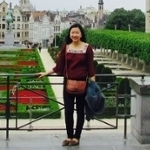 ECE student, Sophie Zhang '17, shares her study abroad experience in Brussels. For more information about studying abroad visit the Hajim Study Abroad site.